One of about 30 American species or Wild vines with complete botanical name Vitis rotundifolia Michx. In the name of the French botanist André Michaux (1746-1802) honored. It is the only species of the grape subgenus Muscadinia. So it does not count like the other American and Asian species, as well as the European Vitis vinifera to the vine subgenus Vitis. Strictly speaking, therefore, should be called the name Muscadinia rotundifolia . But since most of these sources use this (wrong) name and therefore mostly search for it, it is also in the wine Glossary so stated. Trivial synonyms are Bird Grape, Muscadine Grape, Southern Fox Grape and Vigne Musquée. The species Muscadinia is divided into three varieties. The Vitis rotundifolia Michx. var. munsoniana is up Florida limited. The Vitis rotundifolia Michx. var. rotundifolia inhabits the southeastern quarter of the USA from Indiana to Texas, It grows best where the cotton grows, in bushes, along rivers, in swamps, but also on sandy valley bottoms. And the Vitis rotundifolia Michx. var. popenoei with the trivial synonym Totoloche Grape thrives especially in the subtropical and tropical climate. It occurs in central Mexico, as well as some Central American states such as Belize and Guatemala. Incidentally, the variety Popenoei was formerly considered a species in its own right. There is some discussion about adding the subgenus Muscadinia to the genus, as well as replacing the current division into three varieties by leading three species. Since all Muscadinia varieties have a different set of chromosomes (2n = 40) than the species of the subgenus Vitis (2n = 38), one is crossing with all Europeans Vines, but also with the American species or varieties of the subgenus Vitis very difficult to impossible. The Nodien (Nodes) are without diaphragm (Septum), the tendrils unbranched, the berries are discarded individually to maturity. The thick-skinned, dark berries have a high content of polyphenols ( anthocyanins and resveratrol ). The berries and the vinified wine have a strawberry flavor and the Foxton on. Already in the 16th century Muscadinia grapes were used for the production of port wine-like wines. The enormous resistance to diseases and pests was Harold P. Olmo (1909-2006) recognized. This is especially true for fungal diseases and insects of all kinds. The vine has a perfect resistance against the phylloxera, against Nodositäten and tuberosities, as well as against nematodes (Roundworms) and the vine disease Pierce Disease, Unfortunately, grafting is impossible because vinifera cuttings are rejected by Rotundifolia rootstocks and do not grow together with them. A disadvantage is the low lime compatibility and lacking frost hardiness, Today, the vine is increasingly interesting as a crossing partner. Resistance to Pierce Disease is particularly important in the climatically warm south of the USA. 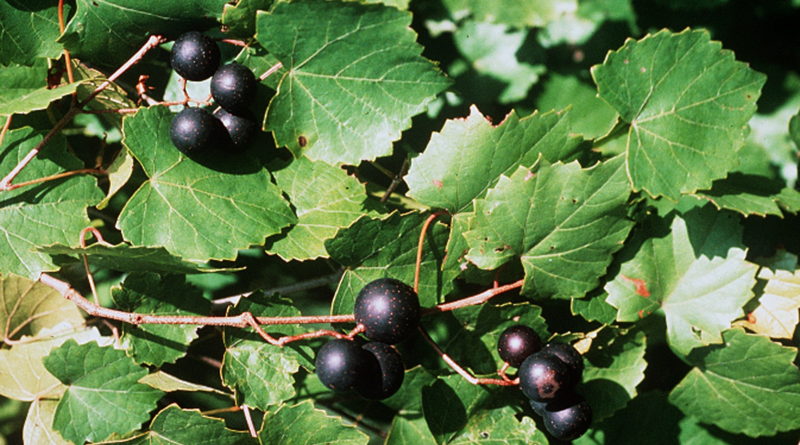 Dehalb cultivate over 300 Muscadinia varieties of various berry colors in these countries. This page was last modified at 8 November 2018 at 12:46.